I’ve always been a big Roy Wood fan. “Fire Brigade” and “Blackberry Way” are two of my favourite songs; I remember sitting as a kid, in front of the TV with my parents, watching Top of the Pops totally transfixed by Roy and the late great Carl Wayne. By the time I got to see Roy live the Move had split, Roy had formed ELO with Jeff Lyne, and then left to form his own ultimate rock’n’roll band Wizzard. I first saw Wizzard when the made their second live appearance at the Reading Festival in August 1972. They had just released “Ball Park Incident”. I recall being surprised how different to the Move Wizzard were, complete with horns and that great full big band sound. I saw Wizzard twice more; at Sunderland Locarno on 19th January 1973, with the Jook support and again at the Locarno on 13th July 1973 with Silverhead support (thanks to Mitch for confirming the dates and support acts). Roy Wood was a marvel to behold in those days, with his distinctive warpaint make-up, long backcombed dyed locks and colourful costumes. 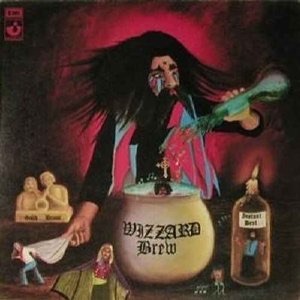 And Wizzard were a big crazy band, complete with piano, cello and horns. They completely filled the small Mecca stage, and the ballroom was packed for those two shows. Wizzard were flying high in the UK single charts with two Number 1 singles “See my Baby Jive” and “Angel Fingers” during 1973, and of course that Christmas song later in the year. Roy Wood understood rock’n’roll and managed to create the Phil Spector “Wall of Sound” both on record and live in concert. Wizzard was, however, a big and expensive band to maintain, because of the large line-up, and in terms of recording costs. Bassist Rick Price: “When we finished recording “Angel Fingers” it was rumoured that we had spent more time in the studio than Paul McCartney had with the whole of the Band on the Run album. Whether it was true or not, this meant that most of the record company’s money was spent in studio time and that the members of the band had to rely on live touring work for their income. A couple of tours in the U.K. and one tour of the U.S. were not enough to ensure regular wages for the band.” By autumn 1975 they had split. Wkzzard line-up: Roy Wood (vocals, guitars, saxophone, percussion); Mike Burney (saxophone, clarinet, flute); Charlie Grima (drums, percussion, vocals); Nick Pentelow (saxophone, clarinet, flute); Rick Price (bass); Keith Smart (drums); Bill Hunt (keyboards, French horn); Hugh McDowell (cello, synthesisers).